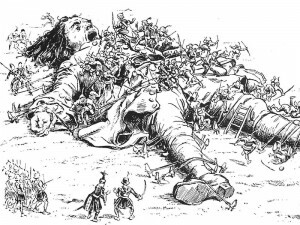 Jonathan Swift’s classic novel Gulliver’s Travels—and in particular the novel’s first section in which the tiny Lilliputians immobilize Gulliver by binding him with thousands of tiny, threadlike ropes—serves as a literary metaphor for today’s American economy. While our friends on the left may complain that it is hyperbolic and chauvinistic to describe the American economy as a colossus bestriding the globe, nobody can dispute that it has been the big kid on the block. Just as Swift’s fictitious Lemuel Gulliver’s strength wasn’t enough to overcome the cumulative effect of myriad tethers, so the American economy’s tremendous strength and energy have been progressively overcome and subdued by innumerable government (and its partner in crime, the Federal Reserve) interferences with the market economy. Taken individually, each intervention has been a minor nuisance in the economy; taken collectively, though, they have been subduing the American Gulliver. The analogy isn’t perfect. The tying up of the American Gulliver has been a decades-long process. And, of course, the “American economy” isn’t a single sentient being, but a composite of several hundred million. What has enabled government to get away with its encroachments is a combination of demagoguery, factionalism, special interests, and the fact that most Americans are content if they are getting theirs, and thus indifferent to encroachments adversely affecting others. —It is impossible to tabulate all the American businesses that have been hamstrung, crippled, or even forced into closure by the oppressive edicts of federal regulatory agencies. We tend to hear about the large corporations that go broke; their sheer size commands national media attention, but countless thousands of smaller businesses have been crippled or crushed by OSHA, the green brigades of the Fish and Wildlife Service, Bureau of Land Management and the green queen bee, the EPA. In declaring independence from Great Britain, the founders complained that the British government “has erected a multitude of New Offices, and sent hither swarms of Officers to harass our people, and eat out their substance.” “Swarms” sounds like an accurate characterization of the present American regulatory state run amuck. (Read Wayne Crews’ “Ten Thousand Commandments,” which estimates the annual cost of federal regulations at $14,768 per household—apart from the immeasurable but considerable lost production that never took place due to financially prohibitive regulation). —During the Obama presidency, federal spending has commandeered a record-breaking share of peacetime GDP. In his insightful economic history, Crisis and Leviathan, economist Robert Higgs detailed the “ratchet effect,” whereby federal spending soared during national crises (whether wars or depressions) then, after the emergency passed, federal spending would recede, but never to the pre-crisis level, thus leading to an unbreakable secular trend toward bigger government. Has the ratchet effect worked in the aftermath of the Great Recession? Sort of. Obama’s stimulus plan succeeded in raising annual spending from the $3.0 trillion of George W. Bush’s last year to $3.5 trillion in 2009—Obama’s misguided attempt to revive the economy via federal “stimulus.” Even though the recession officially ended in summer 2009—meaning that the extraordinary fiscal “stimulus” could be withdrawn—federal spending never came even halfway back toward pre-crisis levels. It remained at $3.5 trillion in 2010, actually increased to $3.6 trillion in 2011, eased slightly to $3.5 trillion in 2012, and looks likely to hit $3.7 trillion this year. With Obama in the White House, a one-year emergency stimulus paved the way for a permanent major increase in federal spending. —One last indicator: The number of federal programs that transfer wealth. I recall that in the mid-1980s, President Reagan charged the Grace Commission with the task of taking an inventory of federal programs. Although the Grace Commission reported that it found it impossible to find out how many people actually worked for the federal government (even in 1985), it did find 963 programs that provided various forms of financial support to individual recipients. Alas, the wealth-redistribution activities of the federal government have continued to grow in the nearly three decades since then. In preparing a talk in March, I found 2,199 transfer programs listed on the government website, The Catalog of Federal Domestic Assistance (cfda.gov). Two days later, I double-checked, and was surprised to find that another program had been added during that brief interval, bringing the total to 2200. Surely, that must have been a fluke during this year of sequester and GOP control of the purse strings via their majority in the House of Representatives, right? Alas, no. I updated my talk a week ago, and when I checked cfda.gov, I found that in less than three months, another 32 federal transfer programs had made the list. Surely such a rate is unsustainable, but for federal transfer programs to be cropping up at a rate of almost three per week shows that the federal leviathan continues to gorge and grow. Wake up, Gulliver! Or is it already too late? Dr. Mark W. Hendrickson is a faculty member, economist, and contributing scholar with the Center for Vision & Values at Grove City College. Welfareship: France’s Status Quo, America’s Future? Does Paul Ryan Want to Take Medicare Away From Seniors?